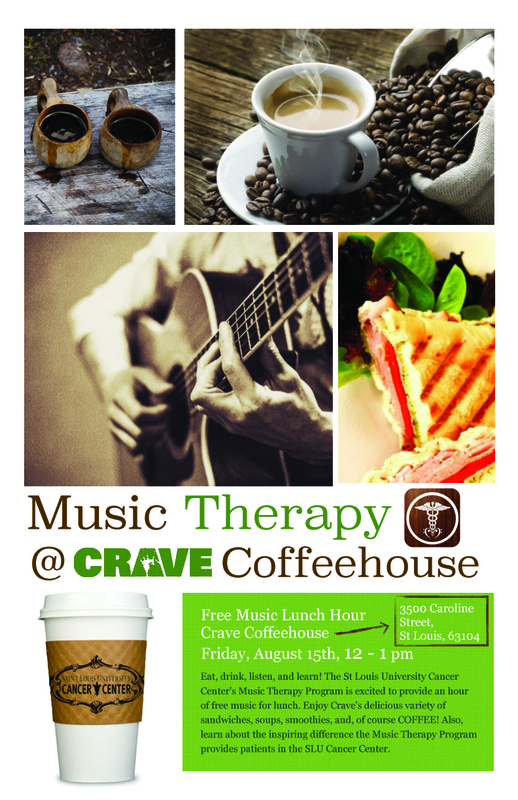 There are few things in this world more complimentary than relaxing music in a Coffeehouse – so we at the Music Therapy department are bringing patrons of Crave Coffeehouse free music to enhance their lunch break. Myself and our very talented intern, Christopher Bachmann, will be playing tunes from 12-1pm on Friday, August 15th. Come join us for some great music, and delicious menu options from our friends at Crave! This entry was posted in What's New and tagged AMTA, CBMT, Chemotherapy, Chord progression, coffee, Education, Guitar, Health, Mark Varvares, Maryville University, Mental Health, mmmmmm!, Music, Music cognition, Music Therapy, Musical composition, oncology, Saint Louis University., salads, SLU Cancer Center, SLU Cancer Center Music Therapy Program, soup, STLMTA.